By the time this post goes live I’ll be whooping it up in Fremantle with my fellow Romance Writers of Australia members at our annual conference. I can’t express how much I enjoy these conferences. Not only are they a great learning experience and incredibly inspirational, I get to catch up with all my writing friends and make new ones. RWA conferences are LOUD. Hundreds of (mainly) women talking and laughing non-stop, squealing and hugging one another. There are times for serious discussion about craft and business, and times for pure silliness, like the Friday night cocktail party where people dress up. But all of them are good times. I can’t wait! Because so many of us are busy with book deadlines or conferencing, I’m taking over Friday Feast today, which means I get to excite you once again with my latest release, Heartland! Heartland is available now in paperback from your favourite bookseller or chain store, or you can order online from most excellent Australian book retailer Booktopia. If ebooks are your thing, try Kobo, JB Hi-Fi Books, Amazon Kindle, iTunes or Google Play. For a full list of retailers check out my website. And now I bring you… ME! I have summer on the brain. Skies so vivid and bright they make your eyes squint. Shimmery, heat-hazed air. The chirrup of crickets and almost screamingly loud song of cicadas calling in chorus. Condensation on cold wine glasses. Dining on the patio in shorts, t-shirts and thongs. Seafood. There’s just something about summer and seafood that blends perfectly for me. Maybe it was all those blazing hot days spend at our beach shack at Nene Valley, on the far southern coast of South Australia. Days where draining crayfish, their shells bright tomato red, hogged the bathtub. When we ate so much crayfish we were sick of it. When my Uncle Phil flash fried thin slices of fresh caught abalone on the barbecue. When it was a thrill to have sausages instead of whiting or snapper or bream. I can’t wait for summer to blister its way back. As soon as it does, seafood will be on the menu. I have quite a few favourite seafood dishes, almost all of them dead simple to make. I’m a great believer that seafood should be left to shine on its own and not overdosed with other flavours or coated in complicated sauces. One of the best recipes I have is one that I pretty much copied from a restaurant on the Vieux Port in Marseille, France, which, for the sake of covering my bum, I’ll call Le Red Fish. Le Red Fish was like the Fawlty Towers of the Vieux Port, and massively entertaining. I think we took every visitor who came over to France there for lunch. The waiters would argue between themselves, eye-rolling, yelling and waving arms. Abuse would be shouted at potential guests who perused the menu display but chose to walk on. The toilets were located up the top of a narrow, slippery and filthy staircase, opposite the kitchen. Once, I found the kitchen door open and managed a glimpse inside, and wished to hell I hadn’t. But the view was brilliant. We’d sit at the outdoor tables, watching tourists and stylish locals promenade. The harbour sprawled in front, laden with expensive yachts, fishing boats, and lined with gorgeous old buildings. 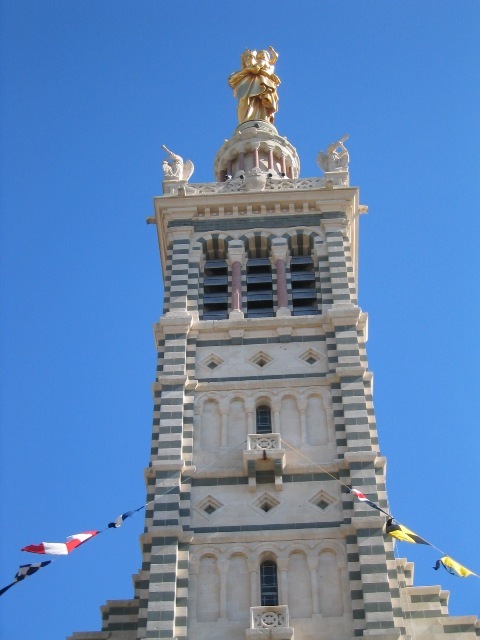 Look up and there stood Notre Dame de la Garde, Marseille’s famous Byzantine style basilica, topped with a magnificently gilded statue of Our Lady gazing benevolently over the sea, protecting sailors as she’s done since the 1860s. To the right, facing one other across the port entrance, were the old twin forts of Saint Jean and Saint Nicolas. 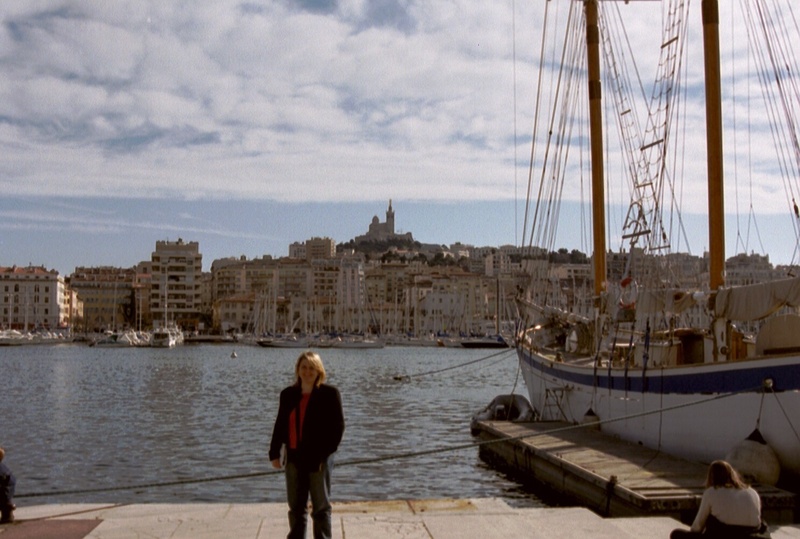 Look left, down toward the Quay des Belges, and there was Marseille’s main thoroughfare, La Canabière. As for the food? Wonderfully simple. Le Red Fish didn’t do flash or complicated. It boasted dishes like soupe de poisson (fish soup), salade de chevre chaud (grilled goat cheese salad), entrecôte grillée (steak) and plat de fruit de mer (seafood platter). My favourite was their prawns in pastis, that famous liquorice flavoured liqueur so beloved in the region. And after much experimentation and consultation of Provencale cookbooks, I managed to invent a pretty good version of La Red Fish’s dish, perfect for a lazy summer lunch washed down with a bottle of pale pink dry rosé. Heat oil in a large pan over medium-high heat. Add garlic and prawns and toss well. 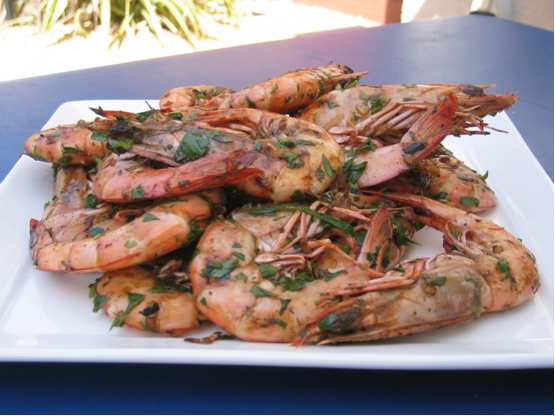 When the prawns are almost cooked, ignite the pastis and pour over the prawns. Make sure you have a lid handy to cover the fire before you burn your kitchen down (as we once nearly did). Toss through parsley and serve. I’ve also tried this with cognac and had tasty results. What dish will you be making this summer? Looking forward to a plain old barbie? What about a crisp salad, or cold Asian noodle dish tossed with hot and sour flavours? Maybe you have fresh seafood on your mind too or a hankering for ice-cold desserts and icecreams that drip. I’d love to hear what tempts you! If you’d like to learn more about me and my books, please visit my website. You can also connect via Facebook, Twitter and this blog! This entry was posted in Friday Feast, Heartland and tagged Australian romance authors, Australian Writers, Booktopia, Cathryn Hein, Cooking, cooking with Pastis, ebooks, Food, France, Friday Feast, Google Play, Heartland, iTunes, Kindle, Kobo, Marseille, Notre Dame de la Garde, Prawn recipes, Prawns in Pastis, promo, Recipes, Romance Writers of Aust, Romance Writers of Australia, rural romance, Summer food on August 16, 2013 by cathrynhein.